On a day German Chancellor Merkel was in town and the European Commission released a new dreary outlook for the European economy, it may be surprising that the little-known head of a regional government could draw a crowd in Brussels. But as the president of the Spanish region of Catalonia, Artur Mas managed to dip into one of the topics du jour in the European Union capital: Just like many people in Scotland and Flanders, Mr. Mas wants Catalonia to split from the nation state that has long been its home and determine its own political, cultural, and economic destiny. But unlike the more than a million demonstrators that took to Barcelona’s streets in September, Mr. Mas doesn’t use the word “independence.” Instead, he’s lobbying for Catalonia, one of Spain’s wealthiest regions, to become “its own state within the framework of the European Union.” Catalonia will hold snap elections on Nov. 25, which Mr. Mas hopes will give the necessary momentum for a referendum or consultation over the region’s future within the next four years. 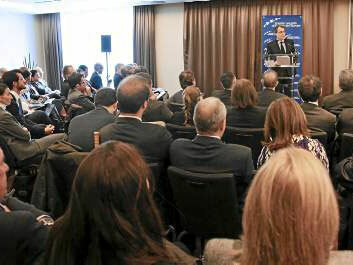 Speaking to a large room full of Brusselites (and television cameras) on Wednesday, Mr. Mas stressed that Catalonia was lagging far behind Scotland on the path to autonomy. There’s no support for his efforts from the central government in Madrid, let alone a deadline or a question for a possible referendum. In fact, Spain’s constitution specifically forbids secession.